Participants on the southern Adirondack lake bored holes at dawn and stayed until dark. They kept an eye on their fishing holes from inside windblown tents and cozy trailers. Some simply stood outside amid single-digit temperatures colder than their cans of beer. Organizer Lou Stutzke, who operates a local convenience store, started the contest with Hank "Beaver" Ross, who was inspired by a competition in the northern Adirondacks that had hourly prizes. Seven years ago, they capped the number of contestants at 1,000. But they have bumped that up and now, their 1,750 slots sell out in a few weeks. Fishing holes are topped by spring-loaded "tip-ups" with little orange flags that whip up when a line is pulled. But pulling in a fish takes skill. Bruce Gollmer kneeled on the ice with the line in his hand. He pulled it in with his bare hands, then let the fish run out some. 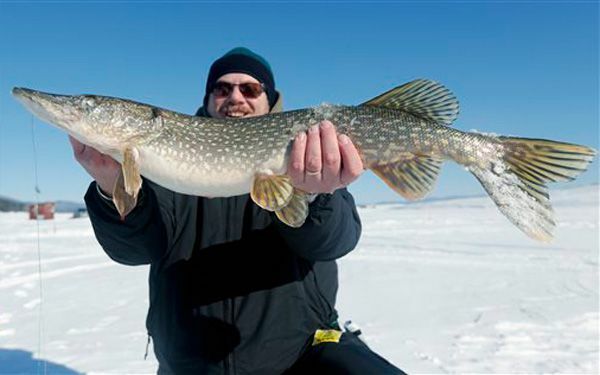 He finally landed a 32-inch northern pike. "They've got a mouthful of teeth and they'll snap a line with one shake of the head so you want to tire them out and just slowly bring them in," Gollmer said. The cash prizes are nice, but the competition has the vibe of a big party on ice, and if the cold bites more than the fish, few seem to complain. 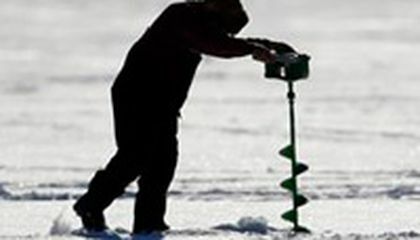 I think that the sport of ice angling is unusual but interesting. People try very hard and have to endure through the tough temperatures to catch a fish. I didn't know that it was actually something that people can compete about and do as a hobby or fun activity. If you go into competitions and catch a big fish, you could receive big cash prizes. It is difficult and requires experience to actually land a fish.